This guide is designed to help you use the learning and teaching material effectively and safely. Use it with discretion and in conjunction with the instructions from the teaching material. Schedule a regular time for daily practice, depending on your time schedule and your physical condition, say half an hour per day and stick to that, no matter what. Try to stick to a fixed time daily so that it becomes a routine you will adhere to. Remember, your health is a top priority. You have to make time for health in order to enjoy life and be effective. Follow the precautions that come with the teaching material. Do only what you can within your comfort zone and simply visualise whatever you can’t do. Consult and work with your health professionals before you start and whenever you encounter any discomfort or problem. You can adjust your level of exertion by the degree of knee bends, use of internal force and the length of practice time. When you reach the end of the DVD, you can practice with me by following me as I demonstrate the whole set with my back facing you. 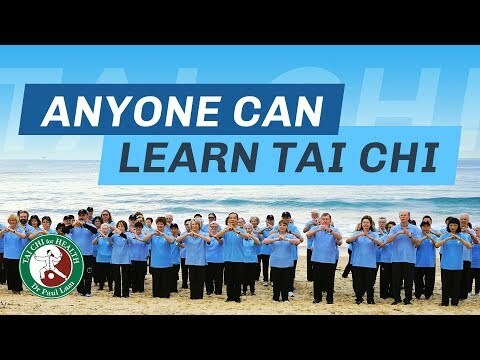 You can use the Tai Chi Music CD for the right rhythm and feel of the tai chi movements as well as gaining more internal energy from the practice. The composer of the music watched me practice tai chi to capture the right rhythm and energy as she composed the music, most of the talented musicians also practice tai chi with me. To the best of my knowledge, no other tai chi music is done in such an ideal way. This is a step-by-step instructional DVD that was tried and tested by many thousands of people. It is designed to teach a beginner the Tai Chi for Arthritis program through many lessons. DON’T TRY TO DO IT ALL IN ONE SITTING. This recording is the main teaching tool of the program. Starting with the DVD together with the handbook or the book Overcoming Arthritis. View the introduction first. It contains information on what tai chi is and the general precautions. Take care to follow the precautions. Read “What is Tai Chi?” from the Tai Chi for Arthritis handbook and background material from it or from the book Overcoming Arthritis. Learn the warmup exercises. These are clearly explained on the DVD, you can follow me as I do them. Use from one to three sessions to learn the warmup, cooling down exercises and Movement 1. Before moving on, practice another one to three sessions until you are proficient at doing them. Always start a session with warmup exercises and end with cooldown exercises. Follow by revision; learn new material only when you are ready. Remember to learn no more than one movement per session. Some movements such as Parry and Punch are difficult. You may need two to six sessions to learn them. Don’t rush. As a general guide for the average beginner doing one session daily, you should finish learning the Basic Six movements in three to six weeks. Practice for another few weeks before moving on. At this point, it might be a good idea to do the reverse side of the Basic Six or you can wait until the end of the complete 12 movements to do the reverse side of the 12 movements. You can find instructions to do the reverse side on the Part II DVD. By practicing the Basic Six, your health will benefit and you’ll enjoy doing it. You don’t have to progress to the advanced movements in order to gain health benefits, especially if you practice both sides of the Basic Six. It’s preferable to do both sides for good balance. Using the DVD, revise your form on a regular basis-weekly or monthly-so that you can continue to improve. The “Six Tai Chi Principles for Beginners” on page 53 of the handbook are listed below. Tai chi contains essential principles, all of which are fundamental and similar in the different styles. When you concentrate on the essential, you speed up your progression, and you improve, no matter what style you do. Don’t worry about the minor details. Focus your practise on these principles. In my workshops and DVDs, I mention these essential principles. Here, I’ve converted them into simple, easy to understand terms. They are classified into: Movement; body and internal. 1. Make your movements slow, even and continuous, maintaining the same speed throughout. In other words, control your movements. 5. Loosening the joints. It is important to do the tai chi movements in a relaxed manner but relaxation here does not mean that all your muscles go floppy. You should be stretching, loosening. Try consciously and gently to stretch every joint from within, almost like an internal expansion of the joints. 6. Mental Focus. Be sure not to get distracted from what you’re doing. Focus on your movement so that your internal and external are well integrated. For several sessions, try to work on one principle at a time until you feel proficient with it, and then focus on another principle. Don’t get discouraged if you don’t perfect them. Not even the best tai chi practitioner is perfect. You’ll get the greatest enjoyment out of improving and discover new dimensions for every principle. Go back to the tai chi principles regularly. As you progress in tai chi, they will take on a some what different meaning to you. Tai chi’s immense depth and near magical power comes from its essential principles. After practicing the forms for a suitable period of time and having done the Six Principles several times, you can move on to the Ten Essential Principles on page 54 of the handbook. You’ll find the essential principles in tai chi written in different texts are similar and could appear simple to beginners. To appreciate their depth, you need to practice. Through practice you can learn and enjoy the different layers of tai chi’s inner meanings. By now you might need a suitable instructor to progress further and to help interpret these principles. Read the book Overcoming Arthritis on how to find a good tai chi teacher, or the article of this topic on my website in the Article section. If you’re unable to find a suitable instructor and if you’re not satisfied with your progress, consider private lessons. You’re welcome to write to me for advice or information. The best way to contact me is to email me at service@taichiproductions.com Or write to: C/O Dr Paul Lam, Tai Chi Productions, 6 Fisher Place, Narwee, NSW 2209, Australia. This is a step-by-step instructional recording designed to not only teach the sequence of the Tai Chi for Arthritis set but also to explore the depth of the 12 movements. It’s done through the teaching of the reverse side of the 12 movements. Take your time. Experience the deeper understanding of each form. Practice them for several sessions until you are able to integrate them into your forms. Remember it’s not how many tai chi movements you can do that make your tai chi magical; it’s how well you’re doing them. When you finish the lessons, you can follow me at the end as I demonstrate with my back facing you. After a suitable period, you may wish to try practicing the reverse side of the nine Part II movements. It’s small, easy to carry and self explanatory. You’ll find it invaluable during your practice. If you’ve forgotten a point or are unsure of the exact position of a movement, you can find it easily in the handbook. You’ll find the explanation of each movement simple and designed to complement the DVD. This book shows how you can use tai chi to help take control of arthritis and your life. It contains comprehensive information on arthritis, tai chi and orthodox and alternative therapies. It features the complete Tai Chi for Arthritis program with photographs of all movements and clear instructions on how to prepare and learn tai chi. You can use this book with the DVD. The book provides each posture in color and thus is more clear than the handbook. Overcoming Arthritis is a useful reference for people with arthritis and for rheumatology professionals. You can bring it to show your medical professionals to assist them in understanding what kind of exercise you are doing. All information is backed by up-to-date research at the time of publication. The book is officially supported by Arthritis Care of UK and Arthritis Foundation of Australia with their respective logos (depending on the country in which it’s published) printed on the cover. This means the foundation’s medical expert team has carefully scrutinized the book and has found it reliable and factual. Almost all of the people who appeared in the book did so as their contribution to people with arthritis, and they have arthritis themselves. The four beautiful and relaxing pieces of music are composed to enhance tai chi practise and performance. I believe tai chi music should be energizing, enhancing and relaxing, with the flow and rhythm of tai thi. I have worked closely with the composer Jenny Ly to achieve these aims. Tai chi integrates mind, body and spirit to achieve inner serenity and power. Tai chi movements should flow smoothly and powerfully as they are driven by an internal energy. Students who practise along side a good teacher can sometimes feel the teacher’s energy magically transfer to them. Composer Jenny Ly works with me to capture this energy in music which can be used to enhance practise and performance. Tai Chi for Arthritis and Part II are derived from the Sun style original forms. The 73 Forms is based on the original 97 Forms, created by Sun Lu-tang. If you do take up learning the 73, remember to use the adaptations as much as possible as shown in the tape. For example, at the jumping up and patting foot movements, it’s much safer to just walk up and pat your thigh rather than jumping up. Many of the movements are more suitable for people who desire to enter competition. How high your level of tai chi is does not depend on how high you can jump or kick. That is the criteria for athleticism. Tai chi is an internal art. How good you are depends on how well you understand and integrate the essential principles of tai chi. Best wishes for a healthier and better quality of life, and enjoy the journey.